Almost every story a journalist writes contains the five W’s: who, what, where, why, when. However, in the last two decades the journalistic profession and it’s employer were forced to make some new transformations. These changes have been caused by different reasons but one stands above the others. This one is even so important that Brian Boyer added a sixth ‘w’, which is for ‘web’ (Boyler, 2008). News organizations, and thus journalists, migrated during the mid nineties to the new environment. The main reason for this migration was the fear that they would loose advertising to small online companies (NY times, 2001). Pablo Bockzowski defines three information practices that the newspapers simultaneously undertook on the web (2004). The first practice was re-purposing print content for the online web. This practice is also known as shovel-ware. Second, there was a recombination of information by taking the print content and ‘increasing the usefulness on their websites through the addition of technical functionality or related content from other sites or both’ (51). The last practice is the most interesting one, it’s creating original content by ‘taking advantage of the unique capabilities of the web’ (51). The efforts of newspapers in this last category differ largely. I would like to focus on two newspapers that have achieved a strong web presence, especially in the original content category. The first one is the New York Times, they went online in 1995 and currently gets around 62 million unique visitors (Glover, 2011). The second paper is the Guardian, the Guardian’s site was launched in 1999, four years after the NY Times and receives approximately 31 million visitors (Glover, 2011). The first category combines traditional storytelling and interaction closely. These online graphics often have a navigation menu with a timeline or a ‘next’ button. The New York Times often use the stepper. It provides a clear path that one has to follow. Extending the driver analogy, it means the user doesn’t drive herself but has a chauffeur. She is allowed to direct the driver, maybe even skip some attractions but she does not have complete control. 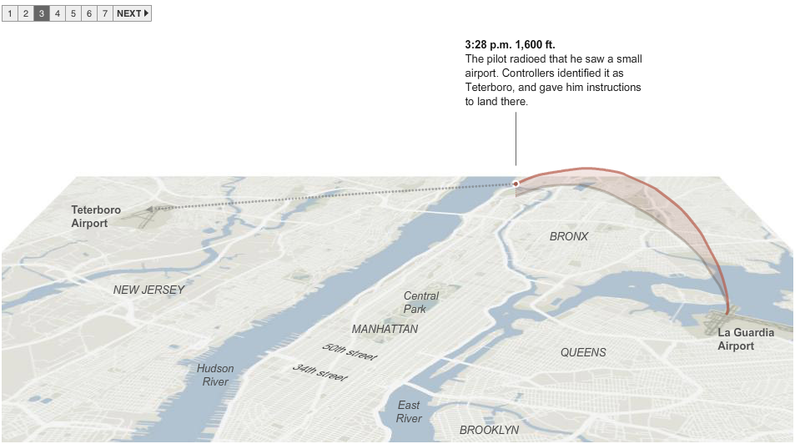 An example of a step-through-graphic is Tracking US Airways Flight 1549 created by the New York Times. The second category gives the user more freedom. Users are able to give input and thereby able to manipulate the data. These visualizations provide users the opportunity to create their own narratives. An example of this kind of graphic is Europe by numbers created by the Guardian. Users can actively discover the differences between European countries by comparing for example life expectancy or cost of living. There is however a play button, which when pressed presents a linear story. The last category is the most active of the three categories. Interactive graphics in this category are exploratory: there is no paved road. Users have to actively explore the environment and maybe contribute to the project. The graphics in this category are completely user-driven. 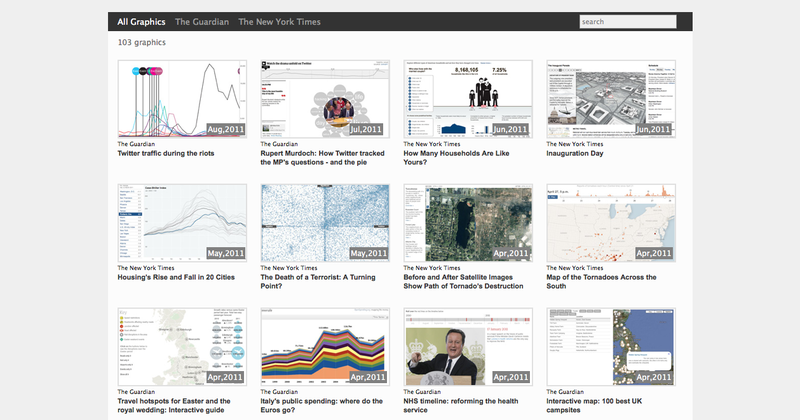 An example is Health Care Conversations by the New York Times. The three different types of interactive graphics show that interactivity does not necessary mean that online graphics are mainly user-driven. Even though every graphic requires involvement from the user, some ask more than others. The last type has the least constraints: users have the most control over the story. They will explore the environment, create their own narratives and interpretations. This could mean that some of the users will not fully grasp the meaning of the ideas behind the graphic. In this case the user has ‘failed’, which is a horror-scenario for the journalist. This could be the reason why the stepper or similar kind of navigation elements are so prominent in contemporary graphics. This kind of interactivity is the most predetermined but also the safest way to keep the story intact. There is a beginning, a middle and an end. I have created an overview which shows a selection of graphics with a direct link to the visualization. While looking through these works it becomes apparent that most projects can be categorized in the first or second interactivity category. However, in some cases it is not possible to put the data into one of these two categories. In that case it is definitely the third category. Some data sets are just too big to fit in such a structure. The Afghanistan war logs from the whistleblowing website Wikileaks is the perfect example of this. More then 90.000 classified documents were released on July 25, 2010. Wikileaks had beforehand enclosed the documents to the Guardian, the New York Times and SPIEGEL. According to Simon Rogers, a Guardian news researcher who worked on the logs, Wikileaks has been the big game changer for data journalism (Rogers, 2011).